The Full Moon on 18 August 2016 is close to being a visible eclipse, and if you are a reader of astrological literature you have probably seen this lunation noted as an eclipse. Eclipses cannot be more than eighteen degrees away from the transiting lunar nodes, and so the Full Moon technically fits into this parameter as it is seventeen degrees away from the lunar nodes. However, in actuality the shadow of the Earth will not cover the Moon and so it will not be a visible eclipse anywhere in the world. Nonetheless, this still remains a loaded Full Moon within many intense astrological aspects. The Sun at home in the burning immediacy of Leo is off-set by the airy objectification of Aquarius, a sign that can set itself apart and gain reflective insight into the underlying dynamics of any process. The Full Moon in Aquarius illuminates a longview backwards into the fateful events of the past year, bearing in the waters of its Aquarian vessel awareness of the nutritive elements to nourish and cultivate in the forthcoming cycle. Saturn in Sagittarius rules the Full Moon less than a week after stationing direct, while in balsamic conjunction with Mars. This has been a long, long, long balsamic phase between Mars and Saturn since the Mars retrograde period of past months extended its length beyond normal timing. Similar to the dark phase of the Moon, the balsamic phase of cycles between planets is a time of re-visioning in which elements of our past arise to be released or re-seeded within an atmosphere that can feel disorienting and confusing. In the week following the Full Moon the cycle will complete with an exact conjunction between Mars and Saturn, and so the Full Moon enlightens its finale with foundational understanding into what has transpired and what needs to be now taken responsibility for going forward. This is the close of the cycle between Mars and Saturn that began August 25, 2014 at eighteen degrees of Scorpio (the cycle previous to this began August 15, 2012 at twenty-five degrees of Libra), and is amplified by it also being conjunct the royal star Antares and the aforementioned Mars retrograde that occurred in the build up. When Mars and Saturn close their cycle, feelings of needing to finish old unfinished projects can arise along with the impulse to initiate action in an area of life that has been neglected or put off for one reason or another. There can also be feelings of overwhelm over the responsibilities and work involved in soulful desires that vivify expansive vision yet have such an unknown quality that they do not yet seem practical or possible to manifest. It is important to now separate fears of futility from the relationships and goals that are well worth committing to with sustained effort in the coming cycle. What we start now in the disintegration of the previous cycle between Mars and Saturn will not produce our ideal outcome immediately and will require patient cultivation in coming months, but by gaining clarity of what we want we can begin to rearrange our life in support. There is tremendous shifting coming in a month of September filled with eclipses and Mercury retrograde, and so many unknown factors will soon come into play with influences impossible to clearly know at this time. Adding to the potency, Mars and Saturn are coming into conjunction in range of a square to Neptune and the transiting lunar nodes. The square between Saturn and Neptune has been pitting the division lines of Saturn against the amorphous influences of Neptune that dissolve Saturn’s crystallizations to reveal awareness and meaning that the walls of Saturn had been attempting to block. In combination with Mars now joining Saturn in square to the transiting lunar nodes, attempts to seal off one’s hermetic vessel will be put to the test over what needs to be let in versus what can continue to be blocked with a boundary. With Neptune conjoining the transiting south node of the Moon, there are certainly illusions and toxic collective influences we do not want to contaminate the union of Mars and Saturn with. Yet the imaginal field of Neptune in tandem with the purifying aspect of the transiting South Node of the Moon means erecting firm boundaries could be keeping out nourishing elements that can replenish and facilitate important re-visioning. There is a balance to strike between creating healthy boundaries and erecting walls that lead ultimately to isolation. The Aquarius Full Moon points toward listening to one’s inner self and heart rather than subscribing to external doctrines dictating behavior. The rebellious, shocking, and liberating Uranus is activated at the Full Moon, being in sextile to the Aquarius Moon and in trine to the Leo Sun. The added intensity of Uranus to the hard aspects present between Mars, Saturn, and Neptune means that collective events could spin out of control wherever conflicting crusaders of dogmatism cross paths. On a personal level, the dying off of the old cycle between Saturn and Mars activates the aspect of Saturn that strips issues to their bones and penetrates to the core matter at hand. In combination with Uranus being activated so strongly by the Full Moon, there is potential to access potent vision and creative imagination that is simultaneously expansive, liberating, and grounded in the pragmatic reality of one’s circumstances. The fertile visioning quality of the Full Moon is further amplified by the asteroid Pallas Athena being conjunct the Aquarius Moon. All together, the Aquarius Full Moon has numerous aspects accentuating the higher mind of the Water Bearer, the unique capacity of Aquarius to disengage from dominant cultural influences and generate breakthrough thought from within that addresses wider humanitarian concerns. There is much greater power to be found in the Aquarius Full Moon through collaborating in creativity with others of shared passions rather than engaging in destructive combat with those of opposing viewpoints. The natural vistas of Virgo are highlighted at the Full Moon, as Mercury is receiving Jupiter in a conjunction in Virgo, and Venus is separating from a conjunction with the transiting North Node of the Moon, a trine with Pluto, and an opposition with Neptune. The conjunction between Mercury and Jupiter is especially powerful as Mercury being at home and in its exaltation is providing Jupiter with everything it needs to make its final pass through Virgo memorable. Because Mercury will be stationing retrograde in Virgo at the end of August, Mercury and Jupiter will remain in conjunction until Jupiter finally leaves Virgo and enters the sign of Libra on September 9. In addition, in the week following the Full Moon, at the same time Mars and Saturn conjoin, Venus will enter into a conjunction with both Mercury and Jupiter in Virgo. The triple conjunction between Venus, Mercury, and Jupiter will be closest between August 26 and 29. Mercury has already entered its retrograde shadow zone and is close to the degree of its eventual Inferior Conjunction with the Sun when retrograde in September. As a result, the Aquarius Full Moon is illuminating important events, relationships, and issues whose significance will become more apparent as we enter September’s period of eclipses and Mercury retrograde. As Virgo is a place in which thorough and detailed research can be performed, this Full Moon is powerful not only for current research ventures but also to launch into deep investigation into a subject matter that will give the upcoming Mercury retrograde plenty to digest. The added influence of Venus means the week ahead is ideal for purification and weaving harmony into one’s daily choices and environment. In response to any difficult experiences, Venus combined with Mercury and Jupiter in Virgo will facilitate attuning to the changes of the moment for a solution and healing. Finally, there is an opposition between the conjunction of Mercury and Jupiter with Chiron in Pisces that in addition forms a yod with the sextile between Uranus in Aries and the Aquarius Full Moon. There is a lot of tension in these aspects, with Chiron at the trigger point. As a result, whatever wounds, learning, teaching, healing, or mastery you have been working with in relation to Chiron in Pisces in the past six months will be deeply felt. For those who have been doing the deep work of Chiron in these past months, this Full Moon has aspects that can reward the dedicated effort with a significant breakthrough or insight. There is more to come in relation to Chiron in September, as the Pisces Lunar Eclipse on September 16 is conjunct Chiron and the Mercury retrograde will be in opposition. Chiron being activated by hard aspect is usually not easy, but also can generate extraordinary growth when one is willing to open oneself fully to experience and face whatever issues arise without denial, receiving the wisdom of what one encounters. The Aquarius Full Moon falls in the third decan of Aquarius associated with the 7 of Swords card illustrated above by Pamela Colman Smith. The image of a figure stealthily removing five swords from an encampment while leaving two behind is often interpreted as signifying deception and betrayal, trying to get away with something in secret, or utilizing mental strategizing with a willingness to deceive. Known as “Futility” in the Thoth deck, it is also interpreted as becoming overcome with doubts regarding liberating thoughts due to fear over whether or not they can materialize successfully. As a result it can be recommended to cultivate patience and give the vision more time to develop before giving up on it as being fruitless. Austin Coppock in his book on the decans 36 Faces ascribed the image of “The Knot” to the third face of Aquarius, artfully weaving both interpretations of the 7 of Swords card through feelings of becoming frustrated or unhappy with a circumstance we have bound ourselves to with karmic knots. Coppock adds depth to Pamela Colman Smith’s image of the 7 of Swords as a result, pointing out that the stealthy figure has already undergone a long process of consideration and has decided to separate from the situation while discerning what to take of value and what to leave behind. 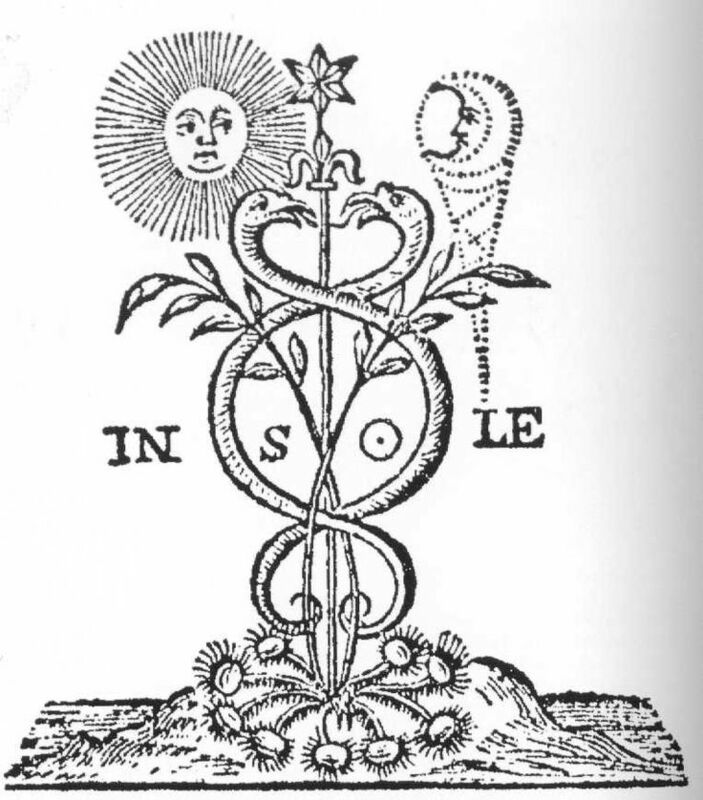 As the final decan of Aquarius, Coppock concluded that it brings up the difficult decision of whether or not to leave the known for the unknown, and “illuminates karmic entanglements and oversees liberation from them,” including the need to pay off debts and salvage the valuable before known attachments can be left behind. The Moon is the ruler of the third face of Aquarius, giving this Full Moon greater strength than it would otherwise have in Aquarius. The surrounding astrological aspects have elements of uncertainty and being at the crossroads between the familiar and unfamiliar, being at the end of an old cycle while sensing the threshold of rebirth. The Full Moon in the sign of the Water Bearer can facilitate purification and replenishment, fostering strength to trod the unknown path, by turning to the waters within for nourishment and reflective guidance rather than the turbulent currents flooding the collective. In the brilliant silvery light of the Full Moon, allow the guidance and personal truth you are seeking to arise from within rather than grasping for it in external entanglements.